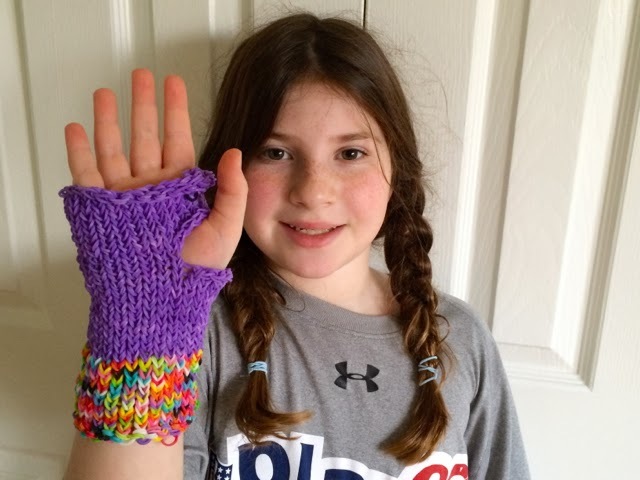 Sabrina is a Rainbow Loom master. Yes, this glove is made entirely of those itty-bitty rubber bands. She did it by following instructions from an online video, as she's done for most of her creations. She's also made a rubber band iPhone cover, and bracelets galore. I joked on Facebook the other day that next, she's going to attempt a Rainbow Loom dress. We were discussing this in the car the other day, where we have some of our best conversations. Sabrina asked, "Isn't my glove amazing?" Years ago, I read that when you compliment a kid rather than generically saying "It's great!" or "That's awesome!" it's more meaningful to give details, and so I do. "I love the colors you chose," I said. "And I'm so impressed by how consistent and neat all the stitching is!" "Mommy, could you have done this?" Sabrina asked, holding up a gloved hand. "Well, I was pretty good at making potholders when I was little, but this is pretty advanced handiwork," I told her. "Could Max make this?" she asked. "With help he could make a bracelet, but I don't think he's at the point where he could do this by himself," I said. Max's fine-motor skills are still coming along, and weaving little rubber bands together would be his idea of torture. Sabrina knew Max couldn't have made the glove or me, either—she just wanted affirmation. I understood. It's nice to be the only one in the family with a particular talent. Growing up, I loved being the kid who could play piano. Max may never rival Sabrina's looming prowess, but she knows he has his own talents. For one, Max has the best memory of us all. Sabrina and I talked about his powers of recall, which are particularly hard to miss when he's telling me I'm driving the wrong way to get somewhere (and he's right). The other day, Max pointed to a pet store and reminded me I once took him there. "That was seven years ago!" I said. "Your memory is amazing." "Wow," said Sabrina, duly impressed. Later, I headed to Five Below to replenish Sabrina's supply of rubber bands. At $1 for 300, I'll only have to take out a small loan if she does decide to make that Rainbow Loom dress. Wow. I can't even make the easy, basic bracelet. With. Help. Tell Sabrina that she is awesome, and yes, she should make herself a dress. I think I'm getting your posts a day late? I just read the post about the Dad and his son with Down syndrome in Argentina (and I love Sabrina's rad mitt, by the way, she's waaaaaaaaaaaaaay ahead of me, any day). I'm really grateful you posted that - I've been trying to find people/Down syndrome community here in Mexico and it isn't easy. It'll be great to reach out to someone further along the way - THANK YOU!! That glove is awesome!! What determination and attention to detail! A dress would be amazing! Wow! That looks like real knitting! Has she tried regular knitting or crocheting? She might really like it. She's taking a knitting class right now, and loving it! Keep weaving, Sabrina! If this is your passion, go above and beyond. Weave that dress and accessories to go with it. That is so cool Sabrina! The glove is very cool, Sabrina! You are very talented. Have you checked out Saori weaving? That might be great fun for Sabrina and Max. It's so soothing and it doesn't take much in the way of motor skills! Don't think she couldn't do it! I know of a girl who made a dress entirely out of Starburst candy wrappers, so a Rainbow Loom dress is definitely a possibility!